Poland Spring Inn and Resort, which boasts the oldest resort golf course in the country, is adding amenities that will create an entire new dimension to the picturesque retreat. 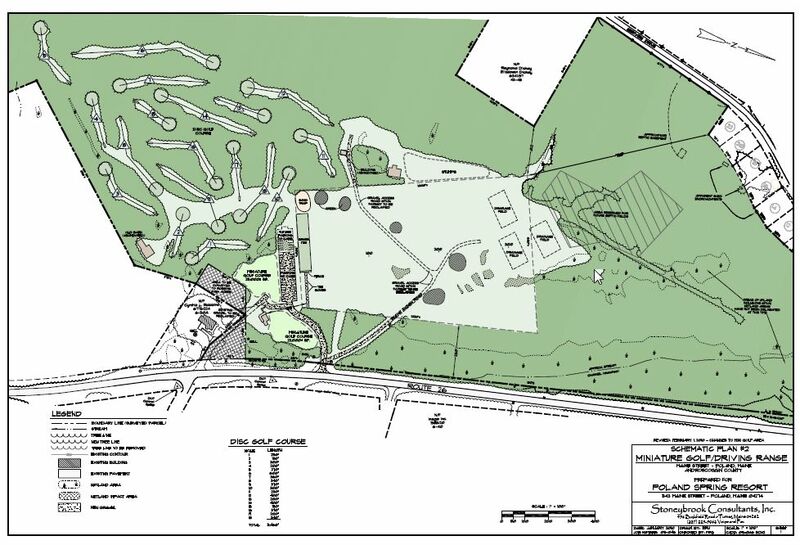 Under the eyes of owner Cyndi Robbins, PGA Professional Allan Menne and head golf course Superintendent James Beaulieu, a 50-acre plot of land is being transformed into a practice range and disc golf course and mini-golf course. The new facilities are being built across the street from the entrance to the resort on Route 26. “It’s a winning opportunity,” said Menne, who joined the staff in April to become the first PGA Professional at The Links at Poland Spring since the late Mel Robbins bought it in 1972. Stressing that The Links at Poland Spring is a daily-fee course open to the public, Robbins pointed out that people can “simply come to the club and practice. A family can come in. Some can hit balls, while others play miniature golf or disc golf — and everyone’s happy. “It’s great for inn guests as well,” she added. Beaulieu said P&K Sand and Gravel of Casco is building the practice range which is 320 yards long and from 500 to 680 feet wide. There will be 70 feet of grass tees and another 10 artificial mats along an 80-foot cement pad. Target greens have been built at 75-, 100-, 150- and 200-yard distances from the tees. Beside the tees, a practice sand bunker sits adjacent to one green and 25 yards from another. Beaulieu expects the range to be hydro-seeded with a low-cut bluegrass blend in late August and ready for play next spring. “Exactly when it opens depends on how much rain we have from now through the fall, and then how well the turfgrass winters,” Beaulieu said, adding that a single-row irrigation line runs down the middle of the grass tee area. Meanwhile, designer Josh Gallop of Lewiston, who holds a bachelor’s degree in architectural studies from Norwich University, is creating a unique, expansive miniature golf course. The four-foot-high models will replicate the Source Building or Springhouse, now part of Poland Spring Water’s bottling plant; the Maine State Building, which sits behind Poland Spring Inn and was part of the Chicago World’s Fair in 1893; the Old Poland Spring Schoolhouse; and an historic railroad depot on Plains Road in Poland, which is now a residential home. Gotto, of Stoneybrook Consultants, said the miniature golf course is laid out over more than acre, compared to the typical one-quarter to one-half acre facility. “We wanted to set aside trees and vegetation between the holes,” he said. Gallop expects concrete will be poured before winter, then resort crews will build the models through the winter so that the course can open next May. Rather than indoor-outdoor carpeting, the course will have a type of synthetic turf, he added. Gotto laid out the disc golf course, allowing plenty of trees as buffers between the holes. The Arthur Fenn House, named for America’s first golf professional who designed the original nine holes of The Links at Poland Spring in 1896, is being renovated inside and will serve as the pro shop for the three amenities. Further information is available by contacting Cyndi Robbins at 207-998-4351; Allan Menne at 207-998-6002; Mark Leslie at 207-933-6708; or at the web site: www.polandspringinns.com.